Aspartame - Why Take the Risk? A couple of months ago, while I was in the checkout line at the grocery store, I noticed the products in the basket of the woman next to me. I am always curious to investigate and discover what a person chooses to feed their body. What initially drew my attention to her cart was the overflowing boxes of green tea in her basket. Seems like a good healthy choice - right? But why was she buying so many boxes of the same green tea product? I asked her if I could see one of the boxes of green tea in her basket. Listed in the ingredients was the artificial sweetener aspartame which is also known as NutraSweet and Equal. Now most people who choose to drink green tea, do so for its health supportive properties. I was completely shocked to learn that a green tea product contained aspartame, which is a known excitotoxin and is considered by many reputable experts to be a chemical poison. I realized that this woman must not know the truth about this artificial sweetener, and that there is still an important need to educate the public about aspartame. Why was this woman buying so many boxes of green tea with aspartame? Excitotoxins like aspartame and MSG are used in food products to enhance flavor. They affect the brain and actually make people crave and consume more of them. I left the store that day knowing that I must speak out again against this deadly chemical poison. On Tuesday, June 23, 2009, I (Artemis in the City) held a free public event where at least 30 people showed up to learn about the dangers of aspartame. Together we watched the documentary film Sweet Misery - A Poisoned World by Cori Brackett. Afterwards, we engaged in very interesting discussion. What was most interesting were the personal testimonies from people in the audience who had serious health problems, who were using products containing aspartame, and who had not known of the dangers of aspartame before attending the event. At least two people acknowledged eye related health problems such as ocular eye bleeding and retinal separation. Both of these were identified in the film by researcher and psychiatrist Dr. Ralph Walton as health problems that occurred among participants in his double-blind study on aspartame. Other people who attended the event, and used aspartame products, acknowledged muscle pain, fatigue, headaches and IBS. What is most tragic is that diabetics, who are in serious danger of neuropathy and retinopathy, are consuming products containing aspartame which is linked as a cause of many neurological health symptoms and illnesses. In fact, ingesting aspartame can trigger or worsen diabetes and aspartame is also linked to many other diseases such as multiple sclerosis, chronic fatigue syndrome, fibromyalgia, parkinson’s disease, epilepsy/seizures, birth defects, alzheimer's disease, mental retardation and cancer. There are over 92 different documented symptoms that have been reported to the FDA as reactions to aspartame. Some of these symptoms include, headaches/migraines, seizures, numbness, weight gain, depression, irritability, insomnia, hearing loss, breathing difficulties, slurred speech, memory loss, dizziness, nausea, muscle spasms, rashes, fatigue, vision problems, heart palpitations, anxiety attacks, loss of taste, vertigo, and joint pain. There has also been an unexplainable increase in brain cancer diagnosis which began in 1984, just six months after the approval of aspartame for carbonated soft drinks. By 1988 – 80% of consumer complaints that were volunteered to the FDA had to do with products containing aspartame. Aspartame is not a natural sweetener but is a chemical drug. It was accidentally discovered in 1965 by a chemist at G.D. Searle who was testing for an anti-ulcer drug. Aspartame consists of three components: 50% Phenylalanine, 40% aspartic acid and 10% methanol. High levels of Phenylalanine, is known to cause neurological symptoms and even brain damage. Aspartate is an excitotoxin that is known to cause neural cell damage by exciting the neural cells to death. The third component of aspartame is methanol or wood alcohol. Methanol further breaks down into formaldehyde, a known carcinogen that the body cannot eliminate. There is considerable controversy regarding G.D. Searle’s research methods and the actual FDA approval of aspartame. In 1977, the FDA recommended that a grand jury investigate Searle for fraud. In addition many of the key people involved in the approval of aspartame eventually secured jobs within the industry. What is important to note is that 100% of industry financed research supported aspartame’s safety while 92% of independent studies found substantial health concerns. Prior to the approval of aspartame, Dr. John Olney’s research had determined that the excitotoxins MSG and aspartic acid caused holes in the brains of mice and that DKP, the breakdown of phenylalanine was connected to brain tumors. Dr. Olney’s brain studies were never presented to the FDA. Additionally, a 52 week study done on infant monkeys correlates brain seizures with high amounts of phenylalanine ingested by monkeys. Once aspartame was withdrawn from the monkeys’ diets, the brain seizures ceased. Years ago, I was a regular consumer of aspartame products. I drank Diet Coke just about every day. I was eventually diagnosed with connective tissue disease and fibromyalgia and had a very long list of health symptoms. By drastically changing my diet, which included throwing out all products containing aspartame, my body was able to completely recover and heal itself. I am convinced that aspartame played a role in my eventual diagnosis of an auto-immune system disease. My story is not unique. Thousands of other people have reported very similar experiences all with the common link of aspartame. Once aspartame was eliminated from their diets their symptoms improved or completely disappeared. This includes Cori Brackett who recovered from a diagnosis of MS after she spent years drinking 6-10 diet sodas a day which contained aspartame. I have been able to confirm that I do have symptoms which are related to aspartame by reintroducing aspartame back into my diet. This discovery was by accident of course and not intentional. A few years ago I bought a package of Double Mint gum. I hadn’t used this product in many years and immediately after chewing it, I developed a severe migraine headache. When I checked the ingredients, I discovered that the gum packaging was labeled with phenylalanine. It is fairly easy to identify products that contain aspartame, as it is required by law that the package warn people that the product contains phenylalanine. There are still so many people who do not know of the dangers of aspartame and are slowly poisoning themselves. I saw another client this week who is taking more than 15 medications and has been consuming multiple products with aspartame. “Individuals with mood disorders are particularly sensitive to this artificial sweetener; its use in this population should be discouraged. I know it causes seizures. I’m convinced also that it definitely causes behavioral changes,” said Dr. Walton. 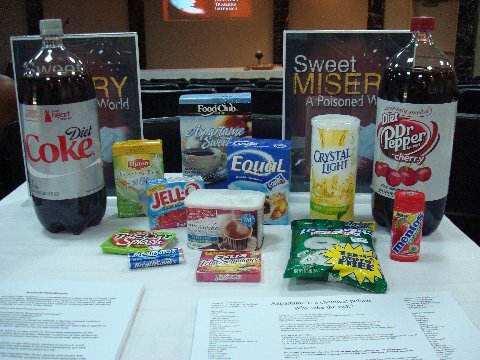 Aspartame can be found in many products which include breath mints, carbonated soft drinks, cereals, chewing gum (sugar-free), coffee beverages, flavored syrups for coffee, flavored water products, frozen ice, frozen ice cream novelties, frozen drinks, fruit spreads, gelatin desserts (sugar-free), hard candies, instant breakfasts, ice cream toppings, ice cream (no sugar added), iced tea beverages (powder and ready to drink), instant cocoa mixes, instant teas and coffees, jams and jellies, juice blends, juice beverages, maple syrups, meal replacements, milk drinks, mousse, multivitamins, non-carbonated diet soft drinks, nutritional bars, pharmaceuticals and supplements including over the counter medicines, laxatives, pies (no sugar added), powdered soft drinks, protein nutritional drinks, pudding, shake mixes, soft candy chews, sugar-free chocolate syrup, sugar free cookies, sugar free ketchup, tabletop sweeteners, vegetable drinks, topping mixes, wine coolers, yogurt, drinkable yogurt (fat free) and yogurt (sugar-free). I believe everyone should eliminate aspartame from their diets because its components are known to cause neural cell damage and cancer. Aspartame is a chemical poison. Why take the risk? In addition there is no evidence that suggests aspartame helps people lose weight. If anything it can be attributed to morbid obesity and other very serious chronic health conditions. This artificial sweetener needs to be banned and certainly should never be given to children or consumed by pregnant women and women who are breastfeeding infants! Since my event on Tuesday, I have received some great feedback and a number of inquiries about aspartame. To be called a 'Foodie Missionary' was a really great compliment. This is the reason why I created Artemis in the City, to help people that are not receiving the help that they need or the correct health information. I need for you to help me spread the word about aspartame to many more people. Please tell all of your friends and family about this dangerous chemical poison! Click here to view photos of the recent Artemis in the City event on aspartame. If you would like to create a more vibrant and healthy life and need personal support and assistance to help you get started, please contact me today! I can help you 212.535.3160. Services are provided nationally via telephone sessions. In person sessions are currently available for those living in the East Texas area!